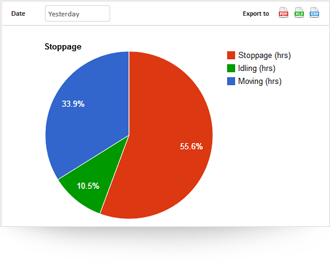 Stoppage : Lets you know for how long of a day your vehicle stopped, moved & engine idled. Time-Speed : At what time what was the speed of your vehicle, identify speeding points on map. Distance – Fuel : How much distance was covered with how many liters of fuel; know well, it’s not cheap. Speed vs Fuel : Assess fuel usage by the variance in speed; realize how speeding affects fuel economy. Temperature : Monitor variations in temperature level of engine/freezers etc; upto 4 can be connected/vehicle. Speeding consumes more fuel and costs you more; identify the exact location & time of speeding. Detailed report on when & where all your vehicle has stopped, for how long, along with timestamps. Engine switched on, but vehicle not moving; fuel loss @ its best, identify drivers who do most and create awareness. Gives you the places/villages through which the vehicles passed, time spent & distance covered in each place. Trip report based on ignition status, ie., Trio report from Ignition switched on to switched off. Trip reports based on the schedules you made for each vehicle in ‘Trip Schedule’ module. Offers you a location based trip report with all the points you made on map (warehouses, offices etc). 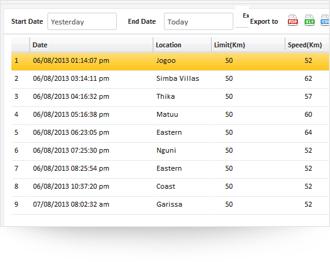 A cumulative report on all the notification alerts generated on a daily basis by a specific vehicle. Day to day report for a month on fuel consumed, distance covered and average mileage. Actual data on how much fuel was refilled into the tank (with timestamps) along with before & after values. Actual data on how much fuel was drained out/leaked/stolen from the tank along with before & after values.